For devotions in the Eastern Catholic Churches, refer to the articles on the individual Churches or the corresponding Orthodox Churches. In the Catholic Church, devotions are prayers and practices followed by believers that are not part of the liturgy of the Church. The United States Conference of Catholic Bishops describes devotions as "expressions of love and fidelity that arise from the intersection of one's own faith, culture and the Gospel of Jesus Christ". Devotions are not considered part of liturgical worship, even if they are performed in a church or led by a priest. The Congregation for Divine Worship at the Vatican publishes a Directory on Popular Piety and the Liturgy. Catholic devotions have various forms, ranging from formalized, multi-day prayers such as novenas to activities which do not involve any prayers, such as Eucharistic adoration outside Mass, the wearing of scapulars, the veneration of the saints, the Canonical coronations of sacred Marian or Christological images and even horticultural practices such as maintaining a Mary garden. Common examples of Catholic devotions include the Rosary, the Stations of the Cross, the Sacred Heart of Jesus, the Holy Face of Jesus, the various scapulars, the Immaculate Heart of Mary, Our Lady of Guadalupe, Seven Sorrows of Mary, novenas to various saints, pilgrimages, devotions to the Blessed Sacrament, and the veneration of saintly images. While the Catholic Church considers liturgy to be central to the life and mission of the Church, it acknowledges the benefit of popular devotions, stating in Sacrosanctum Concilium that "The spiritual life, however, is not limited solely to participation in the liturgy... Popular devotions of the Christian people are to be highly commended, provided they accord with the laws and norms of the Church, above all when they are ordered by the Apostolic See... These devotions should be so drawn up that they harmonize with the liturgical seasons, accord with the sacred liturgy, are in some fashion derived from it, and lead the people to it, since, in fact, the liturgy by its very nature far surpasses any of them." Several factors shape the efficacy of devotional practices in eliciting feelings of devotion: a strong emotional appeal, a simplicity of form which puts them within the reach of all, the association with many others engaged in the same practices, and their derivation from the example of others considered to lead a holy life. Since the Middle Ages, popes have encouraged devotions such as Eucharistic Adoration, the Rosary and the Stations of the Cross, while maintaining the primacy of liturgy over private devotions. Pious devotions have influenced some important parts of the Catholic calendar such as the feast of Corpus Christi which arose after petitions by those following the devotion; or various Marian feasts that gradually appeared with the growth of devotions. Catholic devotions can form the basis of major community events, such as the statue of our Our Lady of Zapopan, which attracts over one million pilgrims on October 12 each year as the statue travels through the streets moving from one cathedral to another. In Catholic tradition, a wide range of practices have developed, ranging from devotions to the Holy Trinity to specific saints. The three-level hierarchy of latria, hyperdulia and dulia determines the appropriate type of worship or veneration for different situations. Latria (from the Greek λατρεία, latreia) is used for worship, adoration and reverence directed only to the Holy Trinity. Dulia (from the Greek δουλεία, douleia) is the kind of honor given to the communion of saints, while the Blessed Virgin Mary is honored with hyperdulia, a higher form of dulia but lower than latria. Various unapproved acts such as the promotion of chain letters that contain prayers or the belief that the use of a statue of Saint Joseph can speed up the sale of a house have been discouraged as non-pious, superstitious and against Catholic values. In general, acts and beliefs that aim at the manipulation of divine power for specific gainful purposes are always condemned as contrary to Catholic devotional practices. The Feast of the Holy Trinity is a devotional day celebrated on the first Sunday after Pentecost and honors the three Persons of God: the Father, the Son, and the Holy Spirit. The Novena to the Holy Trinity may include the Glory Be prayer, as well as other prayers, although the other prayers may vary. According to the Fátima seer Lúcia Santos, in late September or October 1916, the Angel of Peace appeared for the third time to herself and the other visionaries, her cousins Francísco and Jacinta Marto, and taught them a prayer of reparation to the Holy Trinity. Several widespread devotions in the Catholic tradition relate directly to Jesus. Official Catholic teachings consider Eucharistic adoration an important practice which "stimulates the faithful to an awareness of the marvelous presence of Christ and is an invitation to spiritual communion with Him." In many cases Eucharistic adoration is performed by each person for an uninterrupted hour known as the Holy Hour. The inspiration for the Holy Hour is Matthew 26:40 when in the Garden of Gethsemane the night before his crucifixion, Jesus asks Peter: "So, could you men not keep watch with me for one hour?". Some devotions have the form of Acts of Reparation to Jesus Christ for the sufferings and insults that Jesus endured during His Passion or for the sin of blasphemy, e.g. the Golden Arrow Prayer. Devotions involving the Sacred Heart of Jesus first appeared in the eleventh and twelfth centuries, but most current devotions are attributed to Saint Margaret Mary Alacoque (1647–1690) and was later encouraged by Pope Pius XI in Miserentissimus Redemptor. 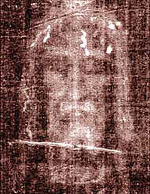 Secondo Pia's negative of the image on the Shroud of Turin, used in the devotion to the Holy Face of Jesus. The devotion to the Holy Face of Jesus dates back to Sister Marie of St Peter in 1843 who reported visions of Jesus and Mary in which she was urged to spread the devotion to the Holy Face of Jesus in reparation for the many insults Jesus suffered in His Passion, resulting in The Golden Arrow prayer. The devotion was first approved by Pope Leo XIII in 1885, and further promoted by Sister Maria Pierina de Micheli based on the image from Secondo Pia's photograph of the Shroud of Turin. In 1958, Pope Pius XII approved of the devotion and the Holy Face medal and granted that the Feast of the Holy Face of Jesus may be celebrated on Shrove Tuesday throughout the Church. Other devotions include the Divine Mercy based on the visions of Saint Faustina Kowalska, First Friday devotions which are related to devotion to the Sacred Heart of Jesus, and the Chaplet of the Five Wounds. The practice of devotions to the Blessed Virgin Mary is considered a key characteristic of Roman Catholicism, with the Catechism of the Catholic Church stating: "The Church's devotion to the Blessed Virgin is intrinsic to Christian worship." In 1993, Pope John Paul II encouraged priests to foster devotions to Mary. A wide range of Marian devotions are practiced by Catholics. Some beliefs about Marian devotions have been asserted by the saints and theologians, though not dogmatically approved by the Church, such as the belief that Marian devotions are a sign of predestination that was supported by Saint Bernard of Clairvaux, Saint Bonaventure, Saint Alphonsus Ligouri and R. Garrigou-Lagrange. Since Mary is of all creatures the one most conformed to Jesus Christ, it follows that among all devotions that which most consecrates and conforms a soul to our Lord is devotion to Mary, his Holy Mother, and that the more a soul is consecrated to her the more will it be consecrated to Jesus Christ. Among the many Catholic prayers and devotions, the Rosary is among the most prominent and most often-recited prayers. The rosary is widely emphasized in Roman Catholic teachings; for example, Saint Louis de Montfort's widely read book The Secret of the Rosary discusses the religious and mystical views on the rosary from multiple perspectives. Catholic traditions include specific devotions as Acts of Reparation to the Virgin Mary for insults that she suffers. The Raccolta includes a number of such prayers. Devotions to the Immaculate Heart of Mary date back to Saint Bernard. In the 17th century, Saint Jean Eudes obtained the approbation and the first book on the devotion to the Hearts of Jesus and Mary. The 1830 vision of Saint Catherine Labouré which introduced the Miraculous Medal depicting the thorn-crowned Heart of Jesus and the pierced Heart of Mary had a significant impact on the devotion. On December 8, 1942, Pope Pius XII consecrated the human race to the Immaculate Heart. Other doctrine-based devotions include the Immaculate Conception which was declared a dogma in 1854 In the 20th century Saint Maximillian Kolbe encouraged consecration to the Immaculata, partly relying on the 1858 messages of Our Lady of Lourdes. Although the Scapular may have initially started as a Christocentric devotion, by the end of the Middle Ages it had taken on a distinct Marian tone, to the extent that the Encyclopedia of the Middle Ages called it "one of the main Marian devotions of Christendom". Rosary and scapular devotions have been supported, encouraged and linked by a number of Catholic figures such as popes, saints and cardinals and specific promises and indulgences have been associated with them. The Rosary and the devotional scapular continue to be encouraged together as key Marian devotions in the 21st century. A number of devotions involve Marian Apparitions, e.g. major and approved apparitions such as Our Lady of Guadalupe, Our Lady of Lourdes, Our Lady of Fatima or Our Lady of Akita as well as a multitude of regional devotions across the continents from Our Lady of Good Health in India to Our Lady of Licheń in Poland. Other Marian devotions include The Five First Saturdays, Seven Joys of Mary and Seven Sorrows of Mary. Processions have historically played a significant role in the liturgical and spiritual life of Christians throughout the world. In every culture, public anniversaries, triumphant heroes, religious festivals, and innumerable other events have been marked by parades of local leadership and activists – and participated in by the viewers. In this way, the entire community is able to reaffirm its values and traditions, while inspiring onlookers with a sense of purpose. It is not merely by the title of example that we cherish the memory of those in heaven; we seek, rather, that by this devotion to the exercise of fraternal charity the union of the whole Church in the Spirit may be strengthened. Exactly as Christian communion among our fellow pilgrims brings us closer to Christ, so our communion with the saints joins us to Christ. Devotions to saints may involve specific prayers, or acts such as the naming of schools or children after them. Some devotions seek the intercession of saints to mediate God's grace. Devotions to Saint Joseph include the Novena to Saint Joseph and the Prayer to Saint Joseph, as well as the Cord of St. Joseph. Saint Joseph's Medal is a sacramental introduced in 1971 to celebrate the 100th anniversary of Saint Joseph being declared the patron of the universal church. Saint Joseph's scapular was approved by Pope Leo XIII in 1893. A number of local devotions and customs to Saint Joseph exist around the world, e.g. Alpine regions, Josephstragen (German for carrying Saint Joseph) takes place on the 9 days before Christmas. A statue of Saint Joseph is carried between 9 homes, and on the first day one boy prays to him, on the second day two boys pray, until 9 boys pray the 9th day. The statue is then placed near a manger in the town church on Christmas Eve. Devotions to Saint Michael involve specific prayers and novenas to him, hymns such as Te Splendor as well as the Scapular of St. Michael the Archangel and the Chaplet of Saint Michael. The Prayer to Saint Michael is also a popular prayer, composed by Pope Leo XIII. Devotions to Saint George are also widely practiced by Catholics, given that he is one of the most popular saints in Christianity. These devotions and churches built in his honor date to the 6th century. Many other devotions to saints exist, such as the Novena of Grace addressed to Saint Francis Xavier and the Cord of St. Francis associated with Francis of Assisi. A wide range of other devotional practices can be found among Catholics. An example is the use of a Home Altar. This practice dates back to the early Christians who used to pray in their homes even before churches were built for public worship. In a Home Altar, a cross usually hangs on the wall and images of Jesus, the Blessed Virgin and saints may be displayed, along with a copy of the Bible or other devotional literature. Catholic devotional practices are so wide-ranging at the local level that Catholics in one part of the world may be totally unaware of the local devotional practices in another corner of the world. For instance, devotions to, and the retablos depicting Santa Eduviges (Hedwig of Poland) in Mexico, are virtually unknown to other Catholics, and she remains relatively unknown elsewhere. In fact, despite having Spanish influences at their origin, many of the devotions practiced in Mexico are now quite distinct from those practiced in Spain. ^ "Prayers and Devotions". www.usccb.org. Retrieved 2019-04-02. ^ "CATHOLIC ENCYCLOPEDIA: Liturgical Chant". www.newadvent.org. Retrieved 2019-04-02. ^ a b Ball, p. 341. ^ a b "CATHOLIC ENCYCLOPEDIA: Popular Devotions". www.newadvent.org. Retrieved 2017-12-05. ^ "CATHOLIC ENCYCLOPEDIA: Christian Worship". www.newadvent.org. Retrieved 2019-04-02. ^ "EWTN on Fatima". www.ewtn.com. Retrieved 2019-04-02. ^ "Sacred Congregation of Rites". www.ewtn.com. Retrieved 2019-04-02. ^ "CATHOLIC ENCYCLOPEDIA: Devotion to the Sacred Heart of Jesus". www.newadvent.org. Retrieved 2019-04-02. ^ Pope Pius XI. "Miserentissimus Redemptor". vatican.va. Retrieved 2 April 2019. ^ "THE GOLDEN ARROW HOLY FACE DEVOTION". www.catholictradition.org. Retrieved 2019-04-02. ^ "Angelus, 30 May 2010, Solemnity of the Most Holy Trinity | BENEDICT XVI". w2.vatican.va. Retrieved 2019-04-02. ^ "Holy Face nun beatified, remembered by Pope Benedict XVI". Catholic News Agency. May 30, 2010. ^ "Holy Face Timeline". www.holyfacedevotion.com. Retrieved 2019-04-02. ^ McDermott, Terry (2015-02-17). "Feast of the Holy Face of Jesus « Catholic Insight". Catholic Insight. Retrieved 2019-04-02. ^ "Catechism of the Catholic Church - Mary - Mother of Christ, Mother of the Church". www.vatican.va. Retrieved 2019-04-02. ^ "CATHOLIC ENCYCLOPEDIA: Raccolta". www.newadvent.org. Retrieved 2019-04-02. ^ a b Murphy, pp. 59-60. ^ Calkins, Arthur. The Theology of the Alliance of the Two Hearts, Missio Immaculatae (English Edition) Year III, N° 4 (May to December 2007). ^ "Agenzia Fides - Congregazione per l'Evangelizzazione dei Popoli". Fides.org. Retrieved 2009-05-05. ^ "CATHOLIC ENCYCLOPEDIA: Scapular". www.newadvent.org. Retrieved 2019-04-02. ^ "Thousands of pilgrims throng Velankanni for Christmas". The Hindu. 2006-12-25. ISSN 0971-751X. Retrieved 2019-04-02. ^ a b Ball, p. 504-505. ^ "Catechism of the Catholic Church - The Communion of Saints". www.vatican.va. Retrieved 2019-04-02. Eternal Word Television Network, Global Catholic Network (EWTN), Faith Devotionals.